Ruth Rollins the Point Loma Democratic Club’s President from 2009 to 2013 was honored at the monthly meeting on February 24, 2013 in appreciation for her outstanding efforts and accomplishments. 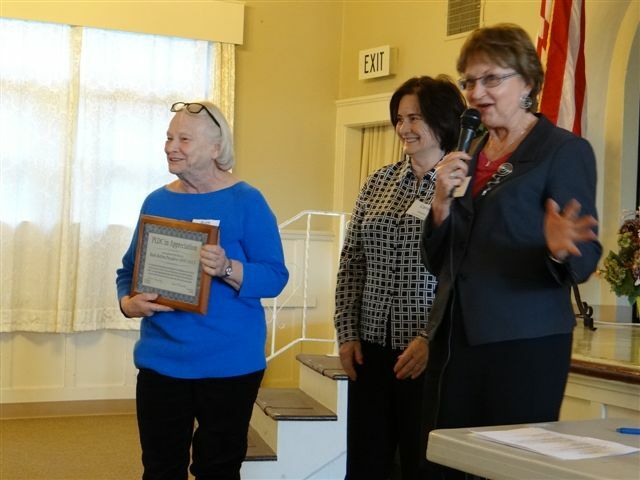 The honor was presented to Ruth by the Club’s new leadership, President Susan Peinado and Vice President Carol Heasley on behalf of the entire Club membership. Ruth’s leadership and team building was clearly of a nature much higher than normally expected and had a noteworthy positive effect on the ability of the Point Loma Democratic Club to contribute to the success of the Democratic Party’s goals at the local and national level. Ruth Rollins is much admired by us all not only as a leader but as a friend. Going forward, as well as serving as the Club’s Treasurer Ruth is the recently elected Director of Clubs on the Central Committee of the San Diego County Democratic Party, and will be a delegate to the State Convention in April. Congratulations Ruth – you give your all and we appreciate you. “BRAVO ZULU”….Ruth… A job well done! This tribute to Ruth authored by Peter Marto represents the deep appreciation we all have for Ruth’s tireless dedication to PLDC over the 4 years of her presidency. Her significant contributions to the growth and the visibility of the club are a lasting legacy that are an inspiration to all of us.